For the Straussian opera, see Guntram (opera). Guntram ("war raven"; c. 532 in Soissons – 28 January 592, in Chalon-sur-Saône), also called Gontram, Gontran, Gunthram, Gunthchramn or (Saint) Guntramnus, was the king of Burgundy from 561 to 592. He was a son (third eldest, second eldest surviving) of Chlothar I and Ingunda. 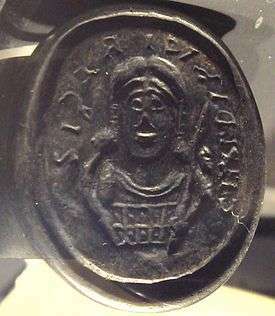 On his father's death (561), he became king of a fourth of the kingdom of the Franks, and made his capital at Orléans. The good king Guntram first took a concubine Veneranda, a slave belonging to one of his people, by whom he had a son Gundobad. Later he married Marcatrude, daughter of Magnar, and sent his son Gundobad to Orléans. But after she had a son Marcatrude was jealous, and proceeded to bring about Gundobad's death. She sent poison, they say, and poisoned his drink. And upon his death, by God's judgment she lost the son she had and incurred the hate of the king, was dismissed by him, and died not long after. After her he took Austerchild, also named Bobilla. He had by her two sons, of whom the older was called Clothar and the younger Chlodomer. Guntram had a period of intemperance. He was eventually overcome with remorse for the sins of his past life, and spent his remaining years repenting of them, both for himself and for his nation. In atonement, he fasted, prayed, wept, and offered himself to God. Throughout the balance of his prosperous reign he attempted to govern by Christian principles. According to Gregory, he was the protector of the oppressed, caregiver to the sick, and the tender parent to his subjects. He was open-handed with his wealth, especially in times of plague and famine. He strictly and justly enforced the law without respect to person, yet was ever ready to forgive offences against himself, including two attempted assassinations. Guntram munificently built and endowed many churches and monasteries. Gregory of Tours relates many miracles performed by the king, both before and after his death, some of which he claims to have witnessed himself. In 567, his elder brother Charibert I died and his lands (the Kingdom of Paris) were divided between the surviving brothers: Guntram, Sigebert I, and Chilperic I. They shared his realm, agreeing at first to hold Paris in common. Charibert's widow, Theudechild, proposed a marriage with Guntram, the eldest remaining brother, though a council held at Paris as recently as 557 had outlawed such tradition as incestuous. Guntram decided to house her more safely, though unwillingly, in a nunnery at Arles. In 573, he was caught in a civil war with his brother Sigebert I of Austrasia and in 575, called upon the aid of their brother Chilperic I of Soissons. He reversed his allegiance later—due to the character of Chilperic, if we may give him the benefit of the doubt in light of Gregory's commendation—and Chilperic retreated. He thereafter remained an ally of Sigebert and his wife and sons until his death. When Sigebert was assassinated later that year (575), Chilperic invaded the kingdom, but Guntram sent his general Mummolus (always Guntrams main weapon, for he was the greatest general in Gaul at the time) to remove him and Mummolus defeated Chilperic's general Desiderius and the Neustrian's forces retreated from Austrasia. In 577, Chlothar and Clodomir, his two surviving children, died of dysentery and he adopted as his son and heir, Childebert II, his nephew, Sigebert's son, whose kingdom he had saved two years prior. However, Childebert did not always prove faithful to his uncle. In 581, Chilperic took many of Guntram's cities and in 583, he allied with Childebert and attacked Guntram. This time Guntram made peace with Chilperic and Childebert retreated. In 584, he returned Childebert's infidelity by invading his land and capturing Tours and Poitiers, but he had to leave to attend the baptism of Chlothar II, his other nephew, who now ruled in Neustria. Supposed to take place on the feast of Saint Martin, 4 July, in Orléans, it never did and Guntram turned to invade Septimania. Peace was soon made. 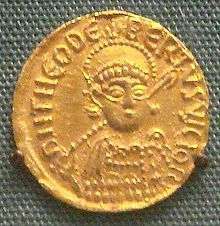 In 584 or 585, one Gundowald claimed to be an illegitimate son of Chlothar I and proclaimed himself king, taking some major cities in southern Gaul, such as Poitiers and Toulouse, which belonged to Guntram. Guntram marched against him, calling him nothing more than a miller's son named Ballomer. Gundowald fled to Comminges and Guntram's army set down to besiege the citadel. They couldn't take it, but didn't need to: Gundowald's followers gave him over and he was executed. In 587, Fredegund attempted to assassinate him, but failed. He went, on 28 November, to Trier to make a treaty with Childebert; Brunhilda, his sister-in-law, Sigebert's wife, whose ally he had always been; Chlodosind, Childebert's sister; Faileuba, Childebert's queen; Magneric, bishop of Trier; and Ageric, bishop of Verdun. This was called the Treaty of Andelot and it lasted until Guntram's death. Also in 587, Guntram compelled obedience from Waroch II, the Breton ruler of the Vannetais. He forced the renewal of the oath of 578 in writing and demanded 1,000 solidi in compensation for raiding the Nantais. In 588, the compensation was not yet paid, as Waroch promised it to both Guntram and Chlothar II, who probably had suzerainty over Vannes. In 589 or 590, Guntram sent an expedition against Waroch under Beppolem and Ebrachain, mutual enemies. Ebrachain was also enemy of Fredegund, who sent the Saxons of Bayeux to aid Waroch. Beppolem fought alone for three days before dying, at which point Waroch tried to flee to the Channel Islands, but Ebrachain destroyed his ships and forced him to accept a peace, the renewal of the oath, and the giving up of a nephew as a hostage. This was all to no effect. The Bretons maintained their independent-mindedness. In 589, Guntram made a final advance on Septimania, to no avail. He fought against the barbarians who menaced the kingdom and quelled an uprising of his niece Basina at a Poitevin nunnery with the aid of many of his bishops (590). 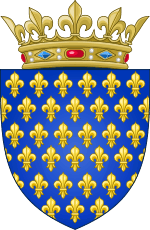 He died at Chalon-sur-Saône in 592, and his kingdom was taken over by his nephew, Childebert II. He was buried in the church of Saint Marcellus, which he had founded in Chalon. Almost immediately Guntram was proclaimed a saint by his subjects and his feast day is celebrated by the Catholic Church on 28 March. The Huguenots, who scattered his ashes in the 16th century, left only his skull untouched in their fury. It is now kept there in a silver case. ↑ Ian Wood, The Merovingian Kingdoms 450–751, (Longman Group, 1994), 56. ↑ Ian Wood, The Merovingian Kingdoms 450–751, 91. Wikimedia Commons has media related to Gontran.